I’d love to have these! The Ttangos look great, and, I’m ashamed to say, Chernin’s work is new to me. 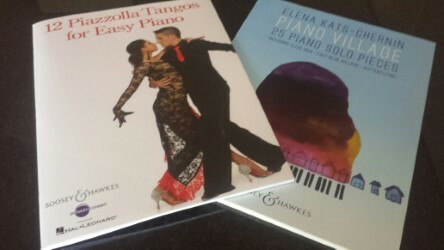 I would love to win either of these, but especially the Piano Village book which sounds intriguing from your description! Both books would be great addition to my library. Thanks, Melanie. Both books look very interesting ! These scores would be great additions to my library! Would appreciate these books. Thank you. I love those tangos and would dearly love to teach some simpler versions to my students. well, to be totally honest, i wouldn’t mind playing some easier ones myself!! These look like the sort of pieces I love to share with my students! Oh wow! I am not familiar with either of these publications. I’m excited about the tangos in particular because I know they would appeal to several of my students. This is so awesome!! I love Tangos! And the pieces in Piano Village are beautiful. I would love to win. Great addition to my repertoire. Such a wonderful pair of books this time — I would love to add to my collection. These are wonderful collections! I have an adult student that would definitely enjoy the Tangos book! So glad to learn about these! this would be amazing-thanks for the chance!